participation in community and culture. Approximately 70 women from Ladakh (including the regions of Changthang, Nubra and Zanskar) create products for Ladakh Nature Products. Their ages range from 18 to 80. Most of these women work in artisan self-help groups in their villages, and a few are individual artisans who work at home. A number of these women work as temporary day laborers for the Indian army’s Border Roads Organization cleaning snowfall and debris from the roads, and on their work breaks and commutes do knitting for Ladakh Nature Products. The women are grateful for this income. In Zanskar the women have been so successful that last year they made a Buddhist pilgrimage to Dharamsala, home of His Holiness the 14th Dalai Lama, with the money they earned. On August 6, 2010, the Ladakh region suffered a major flash flood that took hundreds of lives, damaged towns and villages, and left thousands homeless. On the outskirts of Leh, the village of Choglamsar was devastated. The flood washed a good part of the town down to the Indus River taking people, homes and everything else in its path. The community pulled together to help each other during this tragic time, and Tsering started two income generation groups for 20 women who lost their rooms and homes. She held a basic handicraft training and women came to learn, support each other and remake their lives. 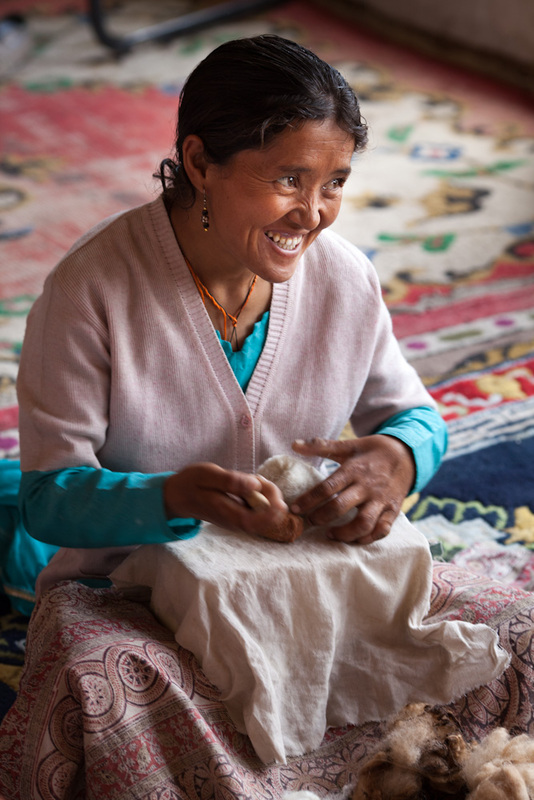 Building upon the success of this training, Tsering requested a permanent room for the women and secured one rent-free, where they work together today doing knitting and felting work. “Slowly they became very happy because otherwise they cannot live alone and were crying and crying,” said Tsering.